Oklahoma is now coming in near last in most measures of civilized society, yet it is still cutting taxes – even as the Capitol Building is falling down. Generous in their hearts, the state Legislature has dug deep into the states resources to find a few hundred million to continue its subsidies for state businesses. One little-known act of generosity is the subsidies to the state coal mining industry. They’ve had a tough time of it, as Oklahoma’s coal is high in sulfur and is not worth much on the fuel market. Over the years the subsidy has been increased from $1 per ton to $5 or $10, no one is quite sure. Estimates are that the subsidies are costing the state about $16 million per year. That is not much when you consider what Oklahomans get for it, richer insurance companies and air pollution. The subsidy is paid as a tax credit, but the coal mines are mostly unprofitable and pay very little in taxes. The laws were a little vague about what to do with the leftover credits, so the coal companies were selling them to insurance companies at a discount, providing cash for the coal companies and a few million dollars per year for our struggling insurance companies. That cushy deal was cut out of couple of years ago, and the coal mines are now required to return the credits to the state for $0.85 on the dollar. Since nobody really wants to buy Oklahoma’s coal, the Legislature required that Oklahoma’s coal-fired power plants buy and use 10% of it to generate power. Since many of the power plants do not have adequate pollution control and scrubbers, the high sulfur coal produces more particulates and aerosols, which are considered air pollution by that interfering old EPA. The state Legislature is now working on a bill which will put a three-year moratorium on building new wind farms in the Eastern Oklahoma while they study the problem. There are 27 windfarms in Western Oklahoma and a number of reports about their success, but apparently it will take the legislature three years to get around to looking at them. I brought that up as the Legislature seems much less curious about the relationship between fracking and earthquakes. A bill to put a three-year moratorium on fracking while the problem is studied – would likely get little support in the state Legislature. Besides, that would leave a lot of money in the Legislature’s pocket with no place to spend it. While digging around for money to support the coal industry, the Legislature turned up an extra $200 million or so, which they are now using to subsidize fracking in Oklahoma. The legislature thinks the subsidy is important as it keeps our frackers from moving out of state, though some tightwad skeptics have pointed out that the frackers are probably here because that’s where the natural gas is. 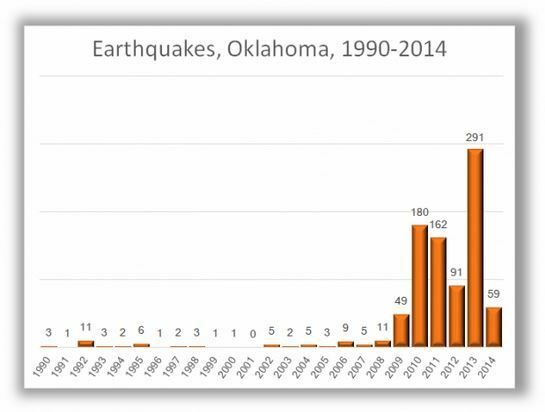 It seems that there’s been a small increase in earthquakes in Oklahoma since fracking started, as shown in the graph. However our state Legislators are not big on graphical data, as it might involve statistics and is most likely based on models or something like that that you can’t trust. And they are not much for research either, as it appears that the federal government has known for decades about the link between injection wells and earthquakes. A number of our citizens, particularly those whose walls and foundations are developing cracks, or those whose chimneys and other stonework are falling down, are beginning to wonder. Getting back to that crumbling infrastructure, there’s been a lot of unusual damage lately to roads and bridges in areas prone to earthquakes. And then there is the problem with the crumbling Capitol Building. Unfortunately, we will never know the cause as the Legislature just doesn’t have the time or money to study the problem. This entry was posted on Thursday, April 17th, 2014 at 8:04 pm	and is filed under Oklahoma Politics. You can follow any responses to this entry through the RSS 2.0 feed. You can leave a response, or trackback from your own site. and I’m shocked why this twist of fate didn’t came about earlier!